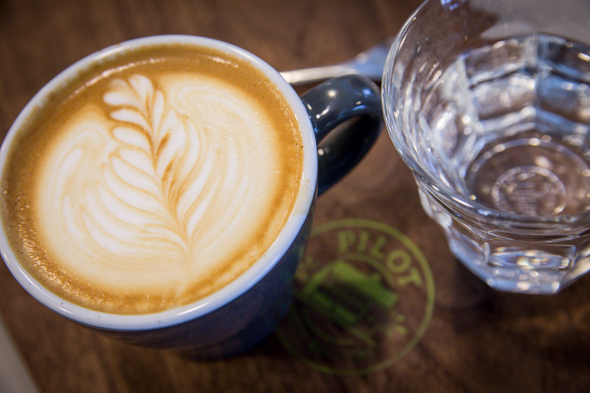 Pilot Coffee Roasters have outdone themselves. They moved the roaster at Te Aro into 50 Wagstaff Drive , making a combination roastery, lab, tasting bar and distribution centre that's slick, gorgeous and technically impressive. 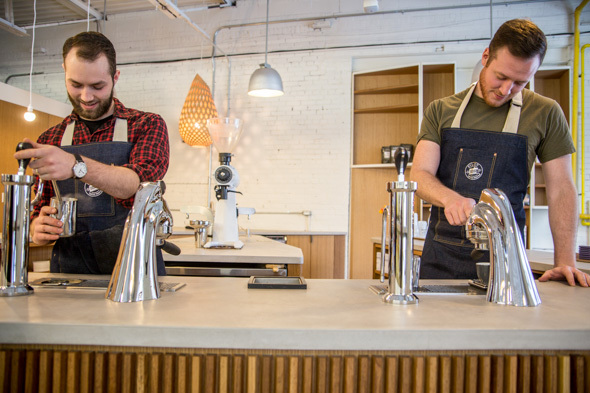 It's unlikely that you'll find another place in the city (or the country for that matter) that shows off speciality coffee culture functioning at such a high level. 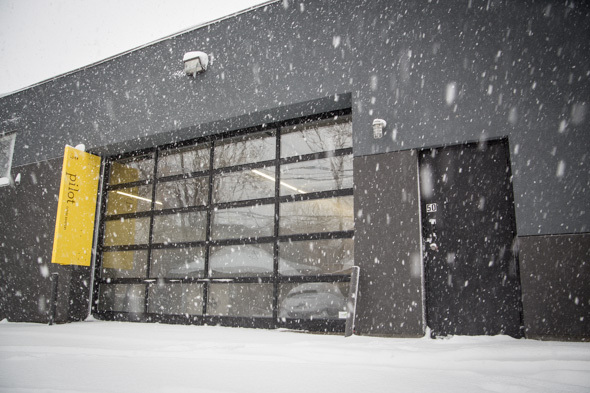 Owners Andy and Jessie Wilkins have transformed the old building supplies warehouse into a state of the art coffee facility, utilizing the warehouse space to encourage education and innovation for baristas, wholesale clients and customers. 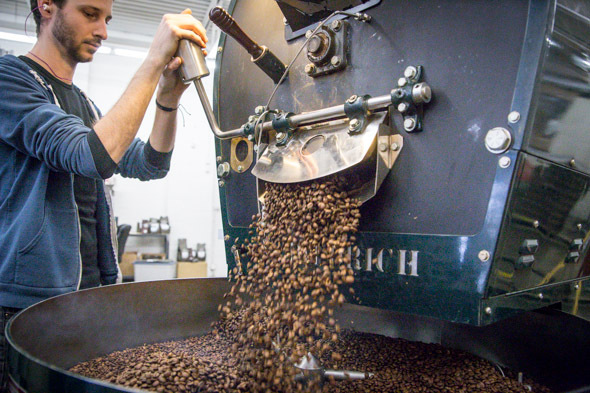 Customers witness bags of green beans, packing and business activity, roasting machines and all methods of brewing in use so they get a sense of the full production from harvest to cup. The coffee lab and cupping room is slightly shielded from the rest of the operation as the heart of the operation. It holds a slew of various coffee machines, grinders, and testing equipment and is there for training, experimentation and workshops. Here every aspect of coffee is explored and the rigours of science put to use. The tasting bar is designed to maximize education and interaction, with the wrap-around concrete and wood bar and stools. It's comfortable and clean, with a focus on the two inset espresso machines embedded in the countertop. I'm hard-pressed to even call them espresso machines at first; they rise up from the counter like old-fashioned seltzer heads in a 50s' diner. Head of Innovation Chris Chekan tells me it's a Modbar espresso machine , one of only 20 in the world and the only one in Canada. The design heats faster than other machines and has controls for volumetric dosing and pressure profiling, but importantly you don't find baristas hiding behind high, bulky machines, just a floating set of eyes like Wilson behind the fence on Home Improvement . 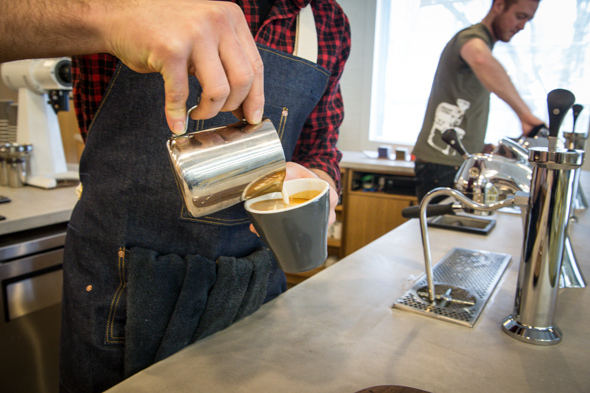 The menu at the tasting bar is divided logically by brew method into Espresso and Immersion. Espresso, made with the Modbar machine, comes either naked ($3.00), with milk (3.25 -3 oz., 3.50 6 oz., 4.00 12 oz.) or with water (6oz or 12 oz. $3.25 - after all it's just water). 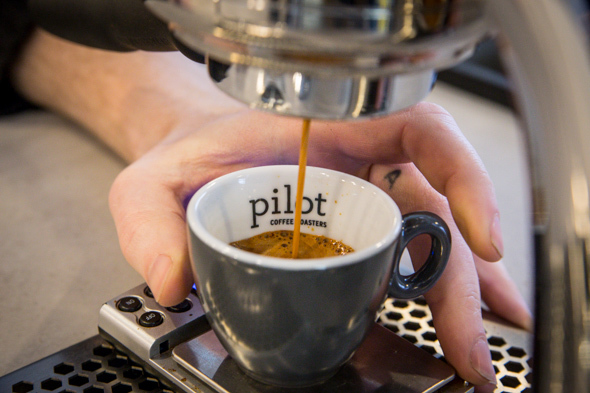 I'm made an espresso with Big Bro , one of Pilot's signature espresso blends, though they also have Elevens and a featured Guatemalan Las Rosas as well. Barista Brett Johnston watches as the tawny crema streams in a spaghetti-thin line from the Modbar machine. I taste chocolate, nuts and banana, with medium acidity and a rich mouth feel. The cappuccino, made with the same bean, is done perfectly - creamy, nuanced and artfully poured. 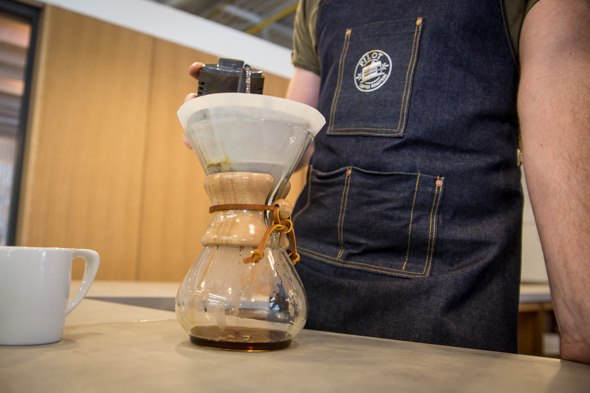 The Immersion methods include Chemex and a custom made pour over and highlight single origin beans roasted on site. Chekan makes much of the smaller immersion equipment including the pour over stands, kettles and serving trays. They're refined and beautiful, adding to the overall experience. I get both a Chemex and pour over demonstration. 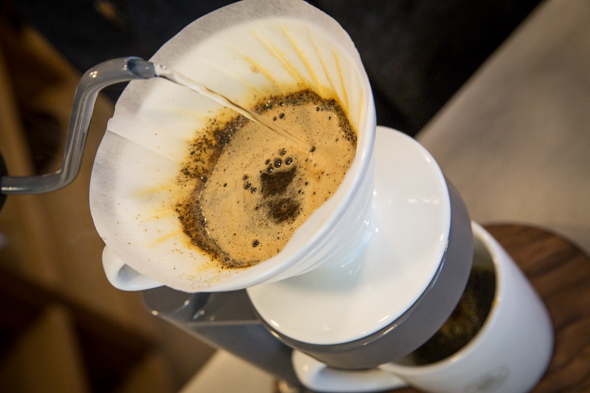 For the pour over, Johnston uses the 2013 Cup of Excellence Guatemala Villaure , wets the filter, adds the coffee, adds a little water and waits for the bloom. This important 30 or 45 seconds lets off the souring gas. He then pours the rest of the water in slowly, with circular hand motions so no dry coffee is left behind. The resulting cup is bright with a hint of caramel, floral notes and a delicate mouth feel. Chekan then does the Chemex, much the same, except he uses a Taza Dorada winning lot of Ecuadoran coffee , a doubly thick paper filter and another very fine metal filter as well. Why? Chekan points to the grinder on the work island behind him, a Mahlkรถnig EK 43, a grinder that's been around for many years, but is currently revolutionizing their product. It grinds the most uniform particle size, resulting in more consistent coffee results. Through their constant testing and sampling, they've found that they can push the grind finer, extracting more flavour and potential dissolvable solids from each bean without getting the bitter, sour taste common in over extraction or the watery wastage of under extraction. The Ecuadoran coffee tastes of orange citrus, and is creamy yet clean on the tongue. 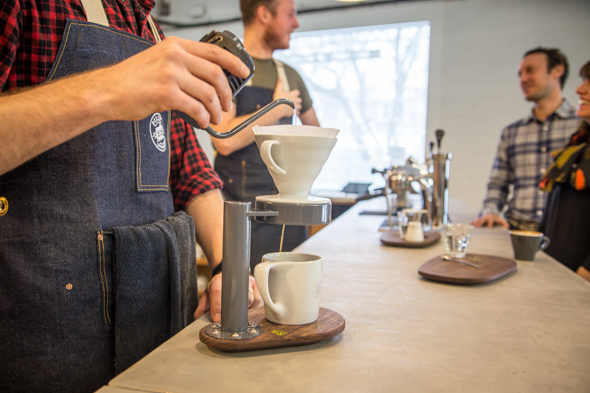 At the end, you can buy much of the smaller equipment and their various beans and test what you've learned at home. As I'm given these samplers of the tasting bar menu, I feel the Wilkins, Chekan and Johnston all joining in, measuring and tapping and looking and talking. At Pilot everything is done with the intention of "fully seeing" what's going on, what's being done, what potential is there to be unlocked. With an increasing scientific approach and continued searching and education, they take out some of the guesswork in what is by nature a very temperamental process, finding that unlike previously thought, each bean type has a perfect roast. You just have to find it. The detail and discussion is remarkable to witness and any coffee drinker would be wise to head to Wagstaff Drive and check it out. It's really something to behold.